NEW YORK -- Bank of America has secured a federal loan commitment that will allow it to finance the world's largest single effort to put solar panels on rooftops, the company said Wednesday. The total cost of the project is $2.6 billion, and will be financed by the private sector over a four year period. The loan guarantee -- made through the Department of Energy -- means the government is on the hook for part of the project's costs should it fail. 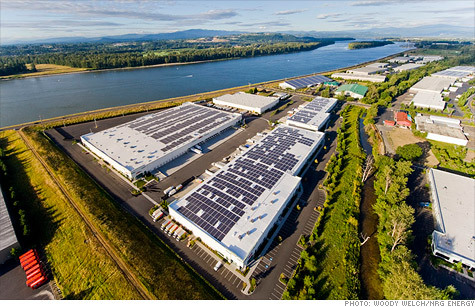 Bank of America (BAC, Fortune 500), which is partnering with industrial real estate owner Prologis (PLD) and the utility NRG Energy (NRG, Fortune 500) on the project, estimates the solar installations will result in 733 megawatts of solar energy production. That's about half the size of a nuclear reactor, or enough energy to power around 100,000 homes. The project involves putting solar panels on hundreds of industrial buildings in a number of states across the country. "This program will nearly double the amount of grid-connected solar online in the United States today and make another positive contribution to cleaner air and a healthy environment," Tom Doyle, president of NRG Solar, said in a statement. The loan guarantee is being facilitated through the Department of Energy's Financial Institutions Partnership Program, a program that is ending this fall, and is likely to spark a series of deals over the coming months. Nathaniel Bullard, a solar analyst at Bloomberg New Energy Finance said the BofA deal is the largest single financing deal produced so far by the program. "What's just as interesting is that it's not just for one project, but a suite of hundreds of projects." Prologis, a large operator and developer of industrial real estate, will provide access to rooftops, in addition to holding an equity stake in the project. NRG Energy is slated to be the lead investor in the project's first phase, a 15 megawatt capacity to be installed in Southern California.